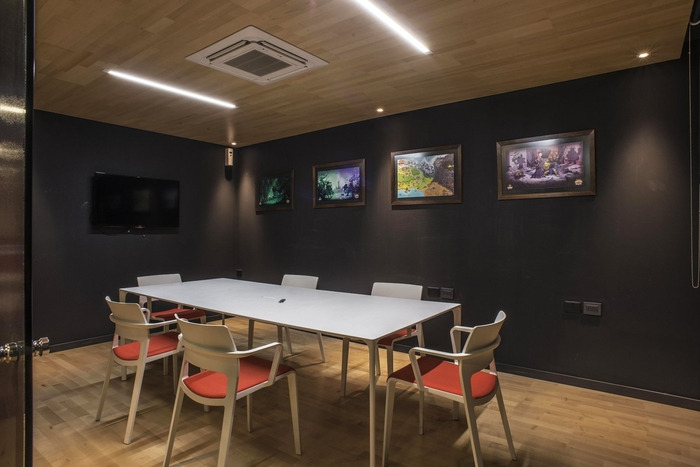 Martinez Rudolph Architects have designed the new offices of gaming company Ironhide Game Studios, located in Montevideo, Uruguay. The new IRONHIDE office should house thirty-five workstations along with multiple conference rooms and dining areas conducive to a highly sociable start-up culture. The finished project represents the merger of four dissimilar units generating a typology that is deliberately disordered on its geometric edges. At the entrance, the visitor is welcomed into the reception with a powerful logo and isotype, meanwhile the centrifugal point of the plan separates the entertainment area from the workspace that is divided into the three, color-coded team sectors—yellow, green and blue—that coalesce into a violet primary meeting room. The color gradient appropriately codifies the space in a both a friendly and understandable manner and is reiterated in the carpeted floor, furniture and articulated band that runs along the program. On the center core of the plan are small capsules for use as meeting or videoconferencing rooms. The hardwood paneling provides both a refreshing and differential warmth to the spaces. The capsules are implanted into the walls creating a room within a room effect and the blackboard walls provide an annotative surface to bolster the core ethics of the brand as fun and innovative as well as publicize ideas and creative initiatives.